T3 and T4 play a critical role in maintaining thyroid function. Perhaps more important is that they are often ignored by conventional physicians despite being easily available through routine blood testing. What is T3 & What does it do? T3 is probably the single most important thyroid hormone. Because it is the most biologically active thyroid hormone and most of the functions we associate with your thyroid gland come from the interactions of T3 in your cells (1). T3 is short for the term Triiodothyronine which is the name given to this form of thyroid hormone. But how does your body create T3? T3 is created FROM the most abundant thyroid hormone in your body T4. 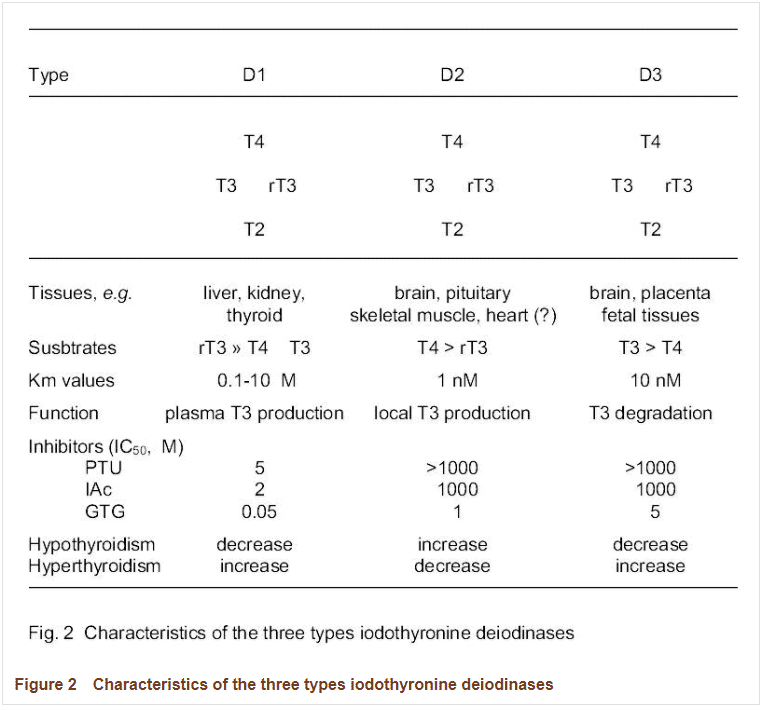 Enzymes, known as deiodinases, remove an iodine moiety at a certain place on the T4 hormone which turns it into the most active thyroid hormone T3 (2). The process by which T4 is turned into T3 is known as thyroid conversion. And this conversion process is critical to understanding how your thyroid works. Thyroid conversion is the method that your body uses to tightly regulate thyroid function in your body. It is used to help create the EXACT amount of thyroid hormone needed at any given time and for all tissues. Your body has created a system in which it can convert, or not convert, T4 into the active T3 thyroid hormone based on the needs of the system (3). So, if you are currently under a lot of stress, or if you need to produce more energy or heat, then your body can rev up the thyroid conversion process to produce more T3. On the opposite side of the spectrum, your body can also choose to slow down the conversion and put energy into more important bodily function in instances where you may be critically ill.
We see reduced conversion in people who are critically ill (4), those in the hospital, people taking certain medications and so on (5). More recently, we also see some patients with obesity and metabolic syndrome with lower than normal T3 levels due to a slowing of peripheral thyroid conversion (6). In this way, thyroid conversion is becoming a more important topic because it influences how Doctors should treat and evaluate certain patients. This regulation is one of the most important concepts to understand in thyroid physiology. Thyroid conversion occurs ALL the time and occurs in major tissues such as your liver, your gastrointestinal tract (7) but it also occurs in each cell. So what does T3 actually do? T3 the thyroid hormone floats around in your blood-stream until it hits the target cell. The first is through non-genomic changes in the cell. Non-genomic changes include directly impacting enzymes and transporters on the surface of the cell itself (8). An example would be the way that T3 activates calcium channels in the heart which may cause palpitations when ingested. The second is through genomic changes in the nucleus of the cell. These changes directly impact the expression of DNA, so it is altering which DNA and therefore which proteins are created. The proteins created from genetic changes go on to increase mitochondrial function, increase ATP production efficiency and so on (9). T3 helps increase your metabolism, improves your gastrointestinal tract, helps regulate your weight, regulates your mood and so on. Perhaps the most important changes that occur secondary to thyroid hormone occur as the result of T3 changes in the cell. What is T4 & What does it do? The majority of thyroid hormone produced by your thyroid gland is actually in the T4 form (also known as Thyroxine). Your thyroid gland, if working properly, produces around 80% T4 and about 20% T3 (10). Which means that T4 is MUCH more abundant in your body when compared to T3. It's also important to understand that T4 is NOT as biologically active as T3. This means that it doesn't have the same cellular effects as T3 and it doesn't activate your cells in the same way. So what is the purpose of T4? T4 helps to serve as a reservoir for T3 conversion, so T4 levels are still critical to proper thyroid function. T4 also does have some cellular activity, but these are not felt to be as strong when compared to T3. T4 is important to understand because most of the medications that Doctors prescribe to treat hypothyroidism come in this form. The idea is that supplying the body with T4 (the less biologically active thyroid hormone) is safer when compared to using T3. T4 also has a longer half-life when compared to T3 (11) and comes with fewer side effects. T3 and T4 tend to get most of the attention when it comes to thyroid hormones, but there are also other forms of thyroid hormones. One such example is T2. T2, also known as 3,5-Diiodo-L-thyronine (or T2 for short) is not as powerful or potent as T3 and T4, but it does have some interesting effects. The main difference between T2 and T3 is that T2 is MUCH less potent than T3 at stimulating genetic expression (12). But that doesn't mean that it can't. Studies have shown that T2 can still stimulate genetic changes in the liver and it does possess thyromimetic effects. Thyromimetic is a fancy way of saying that it can stimulate thyroid function in the cells. T2 also shows that it can compete (although weakly) for binding on the T3 receptors in your cells (13). One important point worth mentioning about T2 is that it is available as an over the counter supplement in the US. T3 and T4 both require a prescription from a physician, but T2 can be taken over the counter. We do not understand exactly how T2 functions or the importance of this thyroid hormone but we know that it may be beneficial in certain patients. Using T2 can help increase energy metabolism in the mitochondria (14) and may be useful as a supplement to existing T4 & T3 dosing. Adding T2 may be helpful in treating obesity for certain patients. Reverse T3, known as RT3 or 3,3',5 triiodothyronine, is an anti-thyroid metabolite. Reverse T3 is created from the conversion of T4. But wait, didn't we already mentioned that T3 is created from T4? How can reverse T3 be created from T4 as well? Both statements are actually true. You can think about thyroid conversion like a fork in the road. Your body has the ability to turn T4 into reverse T3 or T3 itself and it must choose one or the other. If it chooses reverse T3 over T3 then that is one less molecule of thyroid hormone that can be activated. Beyond "stealing" from your potential T3 supply, reverse T3 can also block thyroid action at the cellular level. Reverse T3 has been shown to compete for cellular binding with T3 (15). So not only does converting T4 into reverse T3 lower your circulating T3 levels but it also makes it more difficult for what little T3 is left to bind to and activate your cells. 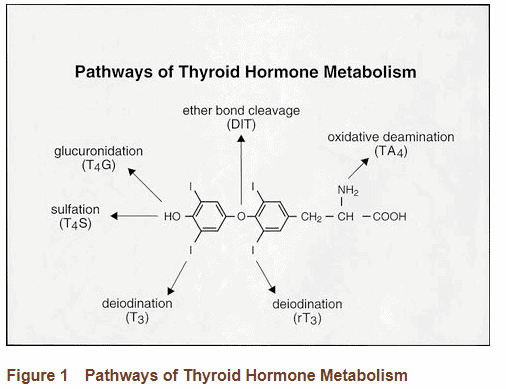 In this way, you can think of reverse T3 as an anti-thyroid metabolite. Your body will preferentially turn T4 into reverse T3 in certain and specific situations. Inflammatory states (16), obesity, metabolic abnormalities, exposure to LPS, exposure to EDC's, illness, medications and so on may all trigger the conversion of T4 into reverse T3. Reverse T3, like the other thyroid hormones, can be assessed in the serum through simple lab tests. Ordering reverse T3 can help give you an idea of what is happening in your body and how well the thyroid conversion process is taking place. It may be confusing to hear about thyroid hormones such as T4 and T3 when you are so used to hearing about TSH. TSH, while important, is not necessarily more important than your thyroid hormones. TSH, known as thyroid stimulating hormone, is a hormone secreted by your pituitary gland. TSH then acts to stimulate the RELEASE of thyroid hormones from the gland. TSH doesn't necessarily say how much T4 and how much T3 to produce, however. It just "stimulates" the gland to produce thyroid hormone in general. The actual activation and conversion of T4 into T3 (which is more important as it relates to thyroid activity) is controlled by the liver, gut, and individual cells. TSH is important, however, in helping to diagnose gross abnormalities in your thyroid gland and in helping to determine how "responsive" the gland is to TSH. If you have high TSH in your blood-stream then that is often a sign that you have LOW thyroid levels in the body or a condition known as hypothyroidism. High TSH is an indication that your thyroid gland is not responding to the TSH. Low TSH, on the other hand, may be an indication that you have TOO much thyroid hormone in the body (known as hyperthyroidism). TSH is an important factor in thyroid management, but it should not overshadow the evaluation of free thyroid hormones such as T3 and T4. In addition, there are situations in which the TSH becomes less helpful as a tool for evaluating thyroid function. Because of the importance of thyroid hormones in thyroid physiology, it's important to evaluate and monitor their levels in your body. 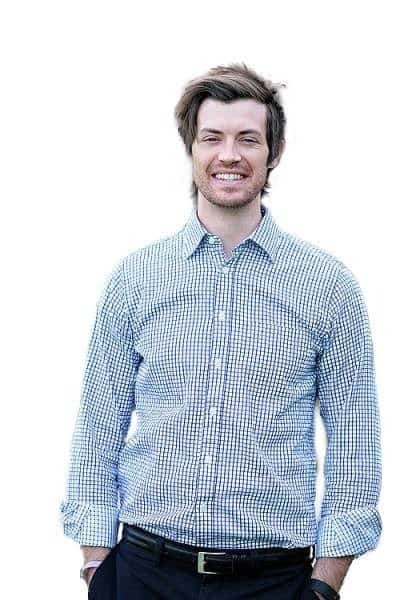 You can do this through simple blood tests for both hormones. These hormones should be evaluated in addition to the standard TSH (Thyroid stimulating hormone) which is often ordered to evaluate thyroid function. TSH gives you an idea of how the pituitary is functioning and how responsive your thyroid gland is, but T3 and T4 give you much more actionable information on how thyroid hormone is being utilized in your peripheral tissues. Always use these blood tests in conjunction with TSH. Free T3 - Free T3 is the number of FREE and ACTIVE thyroid hormone. Remember that T3 is the most potent and biologically active thyroid hormone. For optimal results, this value should be in the top 50% of the reference range (top 20% for weight loss). Free T4 - Free T4 is the number of FREE and ACTIVE thyroid hormone but is NOT as biologically active as Free T3. For optimal results, this value should be in the top 50% of the reference range. Reverse T3 - Reverse T3 is the anti-thyroid metabolite which competes for binding with T3. For optimal results you want this value to be less than 15 ng/dL. When using thyroid medication (such as Levothyroxine or Synthroid) you want to optimize your Free T4 level to be in the top 20% of the reference range and your free T3 to be in at least the top 50% of the reference range. If weight loss is your goal then aim for even higher free T3 levels (top 20% of the reference range). In order to achieve these levels, you may need to use the combination of T4 + T3 thyroid medications. This may require adding Cytomel or liothyronine to your existing dose of T4 or by switching to NDT medications such as Armour Thyroid. Understanding how T3 and T4 work in your body will help you to understand how well your body is functioning. Remember that your thyroid gland controls very important functions in your body ranging from your metabolism to your mood and everything in between. These functions are TIGHTLY controlled and regulated by your thyroid gland, thyroid hormones, and thyroid conversion. Small changes, or dysfunction, to any of these systems, may result in quality of life issues that will manifest as weight gain, depression, fatigue, hair loss and so on. If you suffer from hypothyroidism or another known thyroid disease, please make sure that you evaluate your thyroid hormones in addition to TSH. Ordering T3 and T4 will help shed insight into how well your body is utilizing thyroid hormones and how well you are converting thyroid hormone. If you find that you are not optimal, even if your TSH is normal, then you may need to have your medication adjusted to include different medications or a different combination of T4 and T3. Have you had your T3 and T4 tested? Are you suffering from high reverse T3 or other thyroid issues?